There are so many great waterfalls in the Lakes Region of Maine and New Hampshire, it’s hard to choose which ones to explore when the weather gets nice. Unfortunately, directions can be hard to come by, and you can’t count on last minute pit stops in neighboring towns to yield good answers. With that said, I want to reveal a nice little gem hidden a stone’s throw away from the New Hampshire border. Though they can’t seem to agree on the name of the road, the Stone House Trail leads visitors past sleepy fields of tall grass and wildflowers, past whispering forests and to cool emerald pools. This is the home of Rattlesnake Flume! Rattlesnake Flume, Lower Falls. It’s emerald pools will entice the sweaty hiker! While exploring this beautiful wilderness, make sure not to follow hiking directions to a fault. 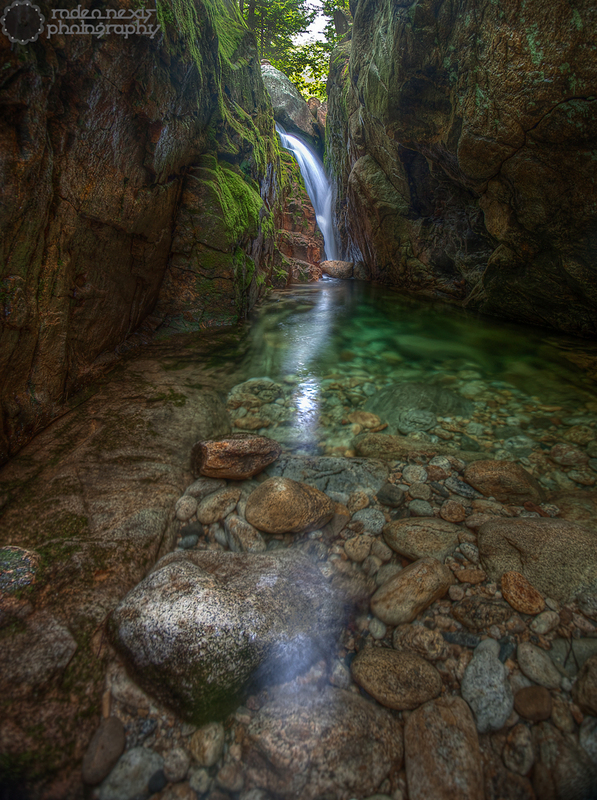 There are so many flumes, falls, and moss covered rocks, everyone can find something new to discover and photograph. Don’t forget to leave things cleaner than you found them, and enjoy the trek! The reason some may say it’s in Stoneham is because there are two approaches. One is from the Stow/Stoneham border off of Deer Hill Rd that leads to Shell Pond; the other more well known approach is via Chatham NH off of rte 113 and Stone House Rd. Thank you for the update! I did notice that trail while driving a dirt road from Stoneham to Stowe. I’ll update my post when I have a chance. We went here just a few weeks ago. It was easy enough to find, but a very windy drive through the woods. When we got close we thought we were going the wrong way. There is a small (one car) dirt road to the parking area (which only can fit about 3-4 cars). At the parking area is a sign that gives directions on how to hike to the falls and pool. They also have some other cute attractions there like the daisy field, log cabin, mountains, apple orchard, etc. The hike was long to the falls, but well worth it. We hiked with a 4 and 5 year old and all of us in flip flops, which probably wasn’t the best choice. We walked in the water all the way down to the end, where there was another small waterfall. We also hiked down to the pool area. It was steep, but we helped the little ones down and they did fine. The water is cold, but the kids didn’t seem to notice. Bring a swimsuit, towel, water shoes, and bug spray!